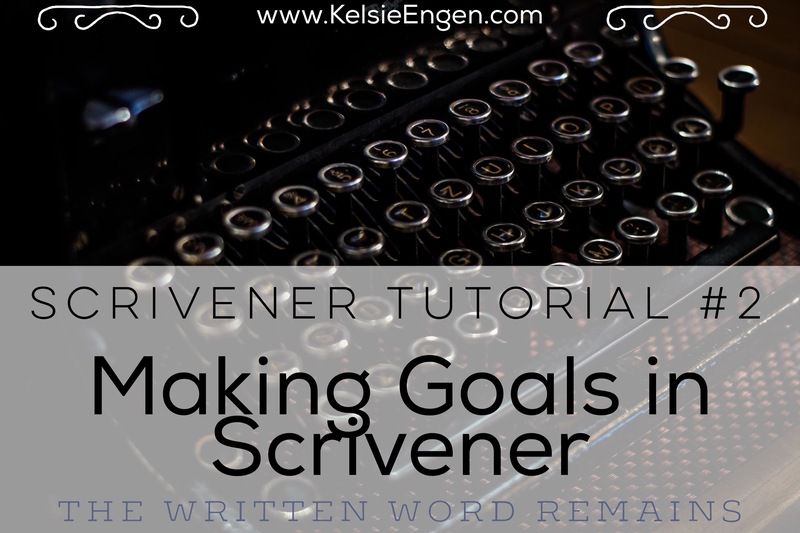 One of the most popular posts I have on my blog is my comparison of Storyist and Scrivener, so I think it’s about time that I talk about them again, as my writing software is what makes my writing easier. 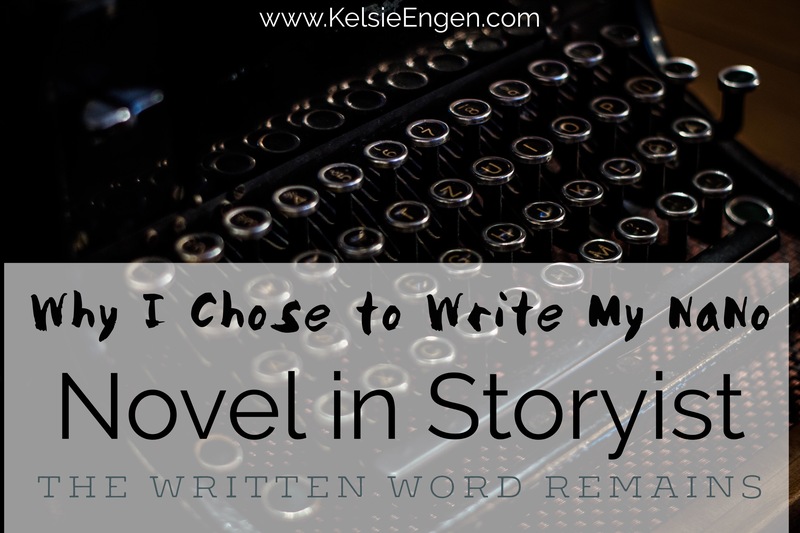 But today, as I’ve chosen this year to write my NaNo novel in Storyist, I want to discuss a few of the reasons why I made that choice. Although those are the two main reasons I chose to use Storyist instead of my beloved Scrivener this year (don’t worry, Scrivener, I am not abandoning you! 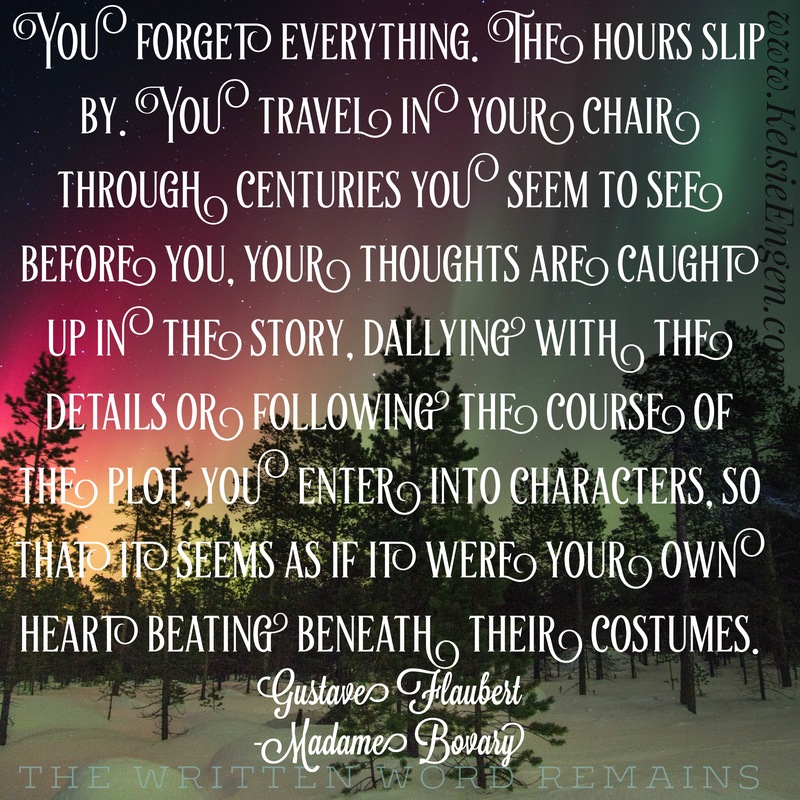 I plan to export my NaNo novel to Scrivener when I have to revise! ), there are others which I explain in more detail below. The single reason I started using Storyist at all is because of the syncing feature. 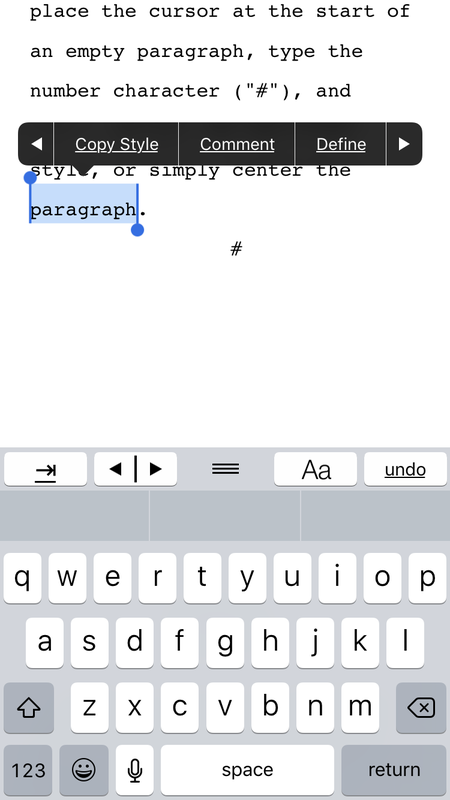 Syncing is a few steps simpler in Storyist than Scrivener, and for that reason, I can type a few sentences on my iPad, then go to my MacBook, then back to my iPad or iPhone and not miss a word. 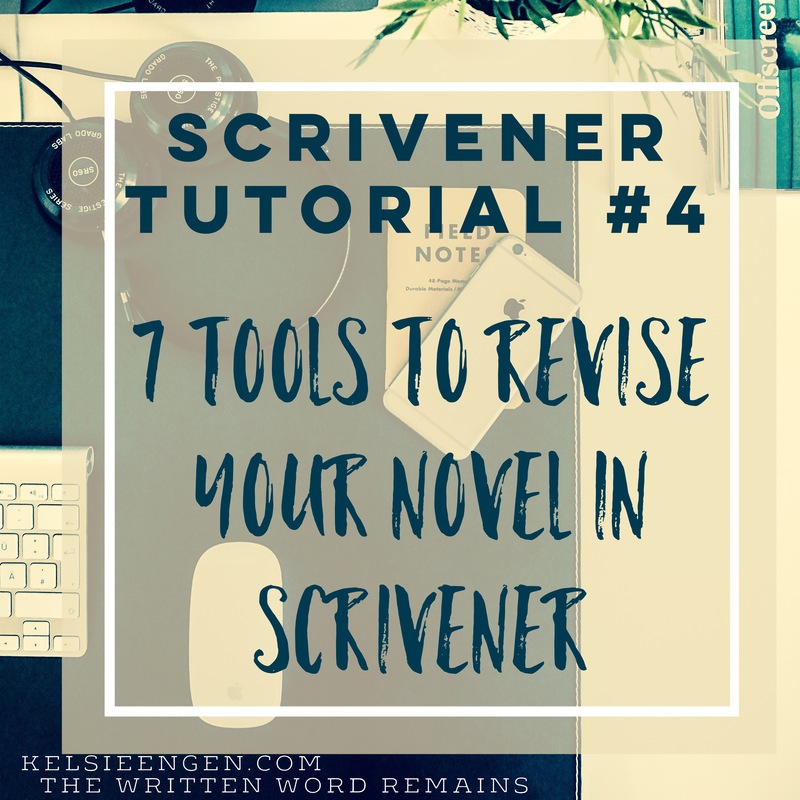 Scrivener involves a few more steps, which I’m not going to get into right now. 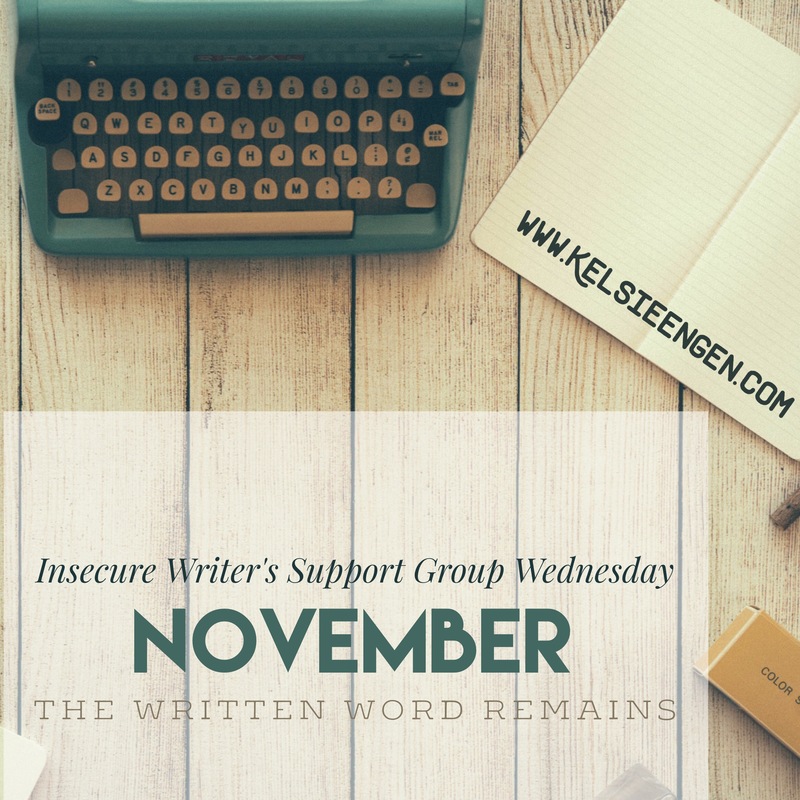 For an event like NaNoWriMo, that’s a great thing to not have to worry about syncing your novel constantly. 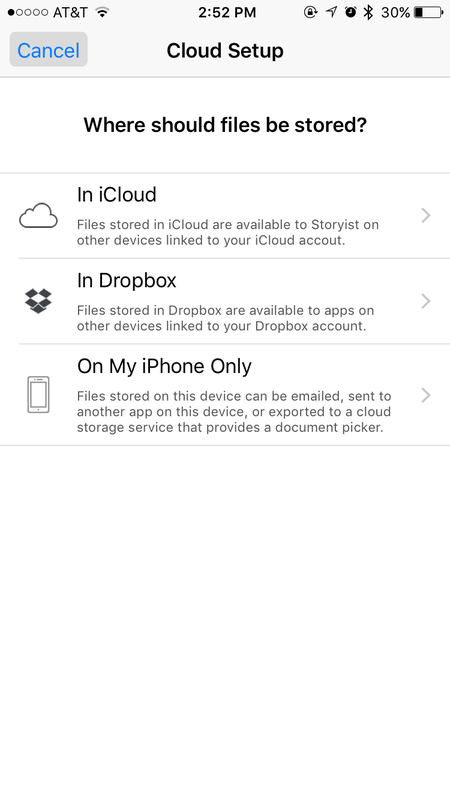 Although Dropbox, iCloud, or your phone’s storage area is required for the app to sync, only using Dropbox or iCloud will automatically sync. If you choose to save only to your phone, then you may email the document to yourself as desired. I used Dropbox, and I love it, now saving all my documents directly to Dropbox and keeping a backup on my computer just in case. But Dropbox has yet to fail me. 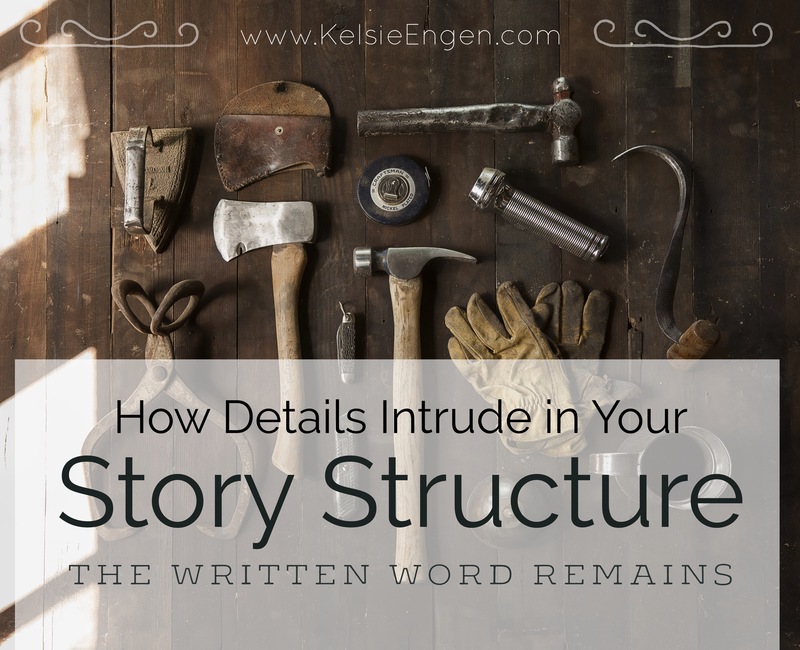 Even though Storyist is simpler in design, it still offers a plotting capability that can keep you in line as you write through your first draft. I’m not as familiar with Storyist as I am Scrivener, and as much as Scrivener gets complaints about being too complicated, I’ve found Storyist’s plotting device more complicated. Perhaps I just haven’t put the effort into figuring it out, as looking at the website for Storyist, it seems eerily similar to Scrivener in abilities and appearance. Storyist offers a plotting guideline for you to get started with, which is probably most helpful for those who tend not to plot at all, or who are just starting to experiment with plotting prior to writing. It’s a simple form of the Freytag’s Pyramid plot, with cards already formed called: Exposition/Inciting Event, Rising Action, Climax, Falling Action, and Denouement. Perhaps because I don’t use the Freytag Pyramid plot, I don’t find this division particularly helpful and haven’t used the plot features much at all. 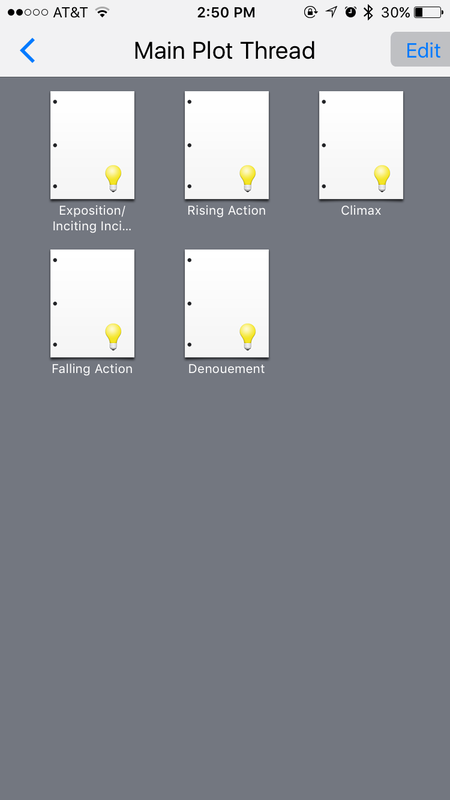 In terms of plotting ability and flexibility, I much prefer Scrivener’s options, which are plentiful. I love typing comments to myself while in the midst of writing. The wonderful thing about Storyist is that even the app allows you to insert comments, so if something occurs to you while you’re on your phone, but you don’t have time to address it, or simply just want to jot something down for later, you still can, all without leaving the app. Simply select your word or sentence where you wish to leave a note, then you should get a pop up menu with the “cut,” “copy,” etc options. Select the arrow to the right, and you should have a “comment” option. 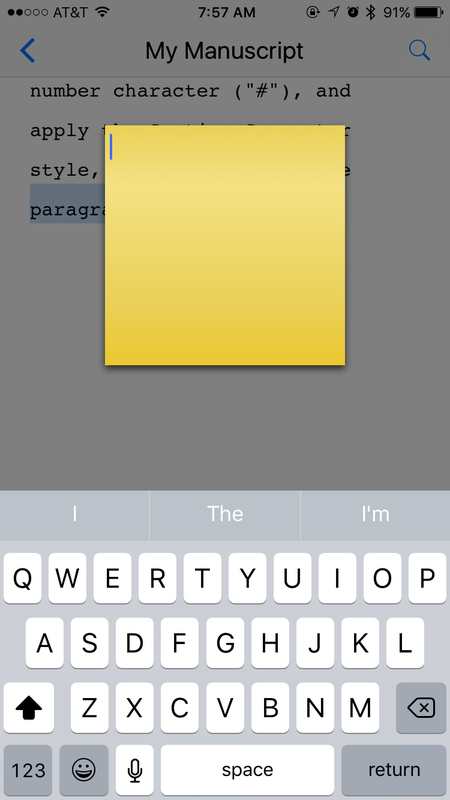 Select “comment,” and and a yellow square comes up where you are free to type in your comment for later reference. Easy peasy. A new scene in Storyist is easy. 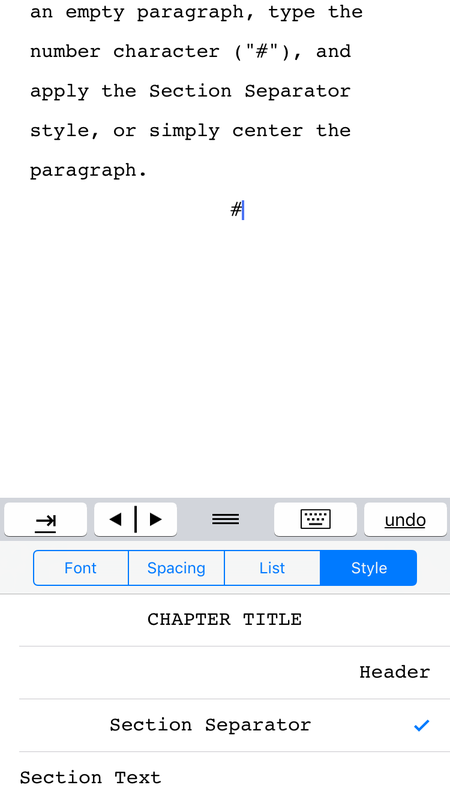 If you have the “Inspector” out, you can click on the Paragraph symbol, which should be the second icon over, just to the right of the “T.” Under that you should have 5 options: Chapter Title, Header, Section Separator, Section Text, and Default Style. In order to start a new scene, as if you were shifting from one location to another in your story but do not require a new chapter to do so, select the “Section Separator” and insert a hashtag as below. (Anyone else think it should still be called a number sign? What has Twitter done to us?) Then hit “return” on your keyboard and your cursor should return to a left justify, where you can continue writing your story but in a new scene. In your app, select the “Aa” button above the keyboard, and then the “style” option, where you tap on the “Section Separator” option. You’ll know if it’s on because it centers your cursor. Insert a hashtag or other marker to show a division of scenes, hit “return” and your cursor should return to left justify, signalling that you are in “section text” mode again. Just as easy. A new chapter is created in the same way, whenever you’re ready. But a new chapter starts 1/3 of the way down the page and can contain one or more scenes. What’s your software of choice? There you have my 4 top reasons for using Storyist this November. 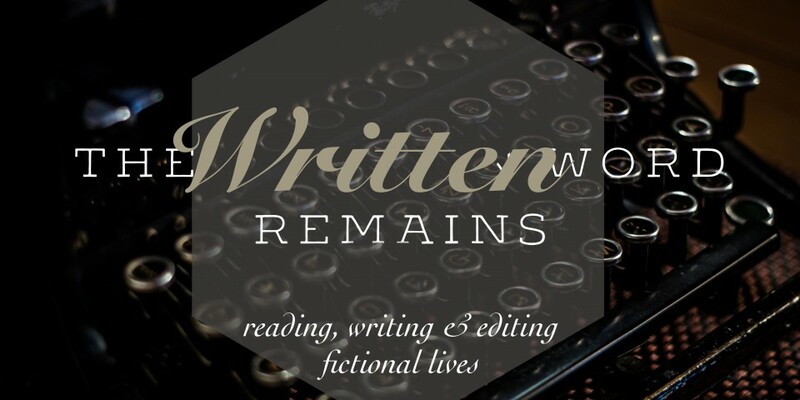 While there are a bunch of normal programs like Word and Text Editor in which you can write your novel, the extra abilities of a story-writing software can really be useful, so I’d encourage you to check them out. Most have a trial period that you can use for free, and whether it’s 7 or 30 days, at least you can dig in and see if it’s an option for you! Software like Stoyrist and Scrivener are also highly affordable for the average person, so you don’t have to part with a fraction of your soul just to use them!